The process of moving house is a juggling act at the best of times but relocating internationally adds additional layers of complexity for your assignee and that means the potential for more stress for them and more risk for you if something goes wrong. As well as the usual tasks like selling / buying / renting property, notifying utility suppliers and moving belongings the assignee will also be managing many additional tasks such as trying to time the arrival of their household goods with their arrival in country, getting to know a new culture or starting in their new role. When combined with the fact that for many this will be the first overseas move this can leave a lot of employees and their families confused and anxious about where to start or what needs doing and when. Many people find checklists helpful in organising their tasks and required activities in preparing for their move. Using a checklist to effectively manage an international move not only helps to reduce the stress of the move on your assignee and their family (thus increasing the chances of a successful assignment) but also reduces the risk to your company of additional costs (both admin and in additional charges) if something gets forgotten or goes wrong. 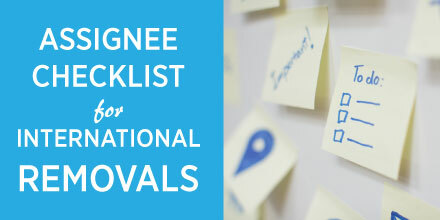 Bournes Relocation Solutions (proud member of the UniGroup Relocation Network, a technical partner of the RES Forum) have put together a free to download and print international moving checklist for your assignees based on the tips and moving experiences from over 140 years of moving people all over the world. This entry was publish on May 1, 2015 / RES Forum. Posted in Uncategorized. Bookmark the permalink.